I got up stupidly early so I could shoot dawn light over the Coronado bridge in San Diego this morning. Took both the Fuji X-Pro1, and the Fuji G617 Panoramic Camera loaded with Fuji Velvia 50, so was able to record the same scene with both digital and film. It’s interesting to see how each medium interprets the light – each have their own strengths, and I don’t think there is a ‘right’ look, just multiple variations on a theme. 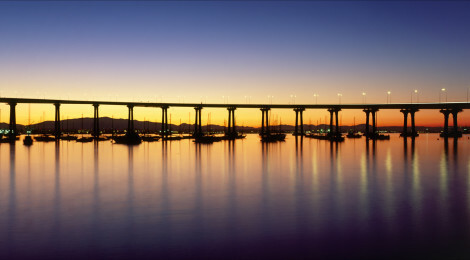 Here’s the Coronado Bridge, taken with the X-Pro1 and 23mm Lens, from North Island. I have to say I like both for different reasons, but the lush colors of the Velvia are just so compelling. Here are a couple of other shots from the same session – using the X-Pro1 and 55-200mm Lens. Chris, it’s post like this that get me to thinking about my darkroom again. Yeah, it’s still down there and needs maybe a day to get running again. Then I look at the photos you post and I kinda feel a tingle inside when I think how nice the XP1 files are. I know there’s a difference and I don’t dispute that but I can’t help from pull back from the analog process. I guess I’m just lazy but I really love seeing what you do with the Fuji Film camera. I had many and loved every one and the negs they made. So I will follow with a tuned eye and a memory of a film camera that made me smile on many occasions. It’s nice to see you pay homage to both….. Thanks Don – if have to say that if I didn’t have a local pro dev lab to use, there’s no way I’d be shooting all this film. I have the luxury of dropping a roll of 120 off in the am, and picking it up in the pm. Not quite as convenient as digital, put not that bad either! I just have to wonder: was the X-Pro1 shot taken in ‘Velvia’ film simulation mode? And in ‘sunny’ white balance? I would guess both settings would be needed to best approximate the real thing (Velvia film, that is). The shot was 2 frames taken as RAW files, so the in-camera Fuji film simulations don’t apply – hopefully the next upgrade of ACR will allow the film profiles to be applied to RAW files during post processing. The final combined RAW image was treated with NIK ColorFX to post process it however – great set of filters if you haven’t tried them. Thanks for your answer, Chris. I still think it would be fun to compare the X-Pro1’s ‘Velvia’ mode (with fixed ‘sunny’ WB) to the real Velvia film. Unfortunately, I no longer have a film camera with me, or I would do this myself.